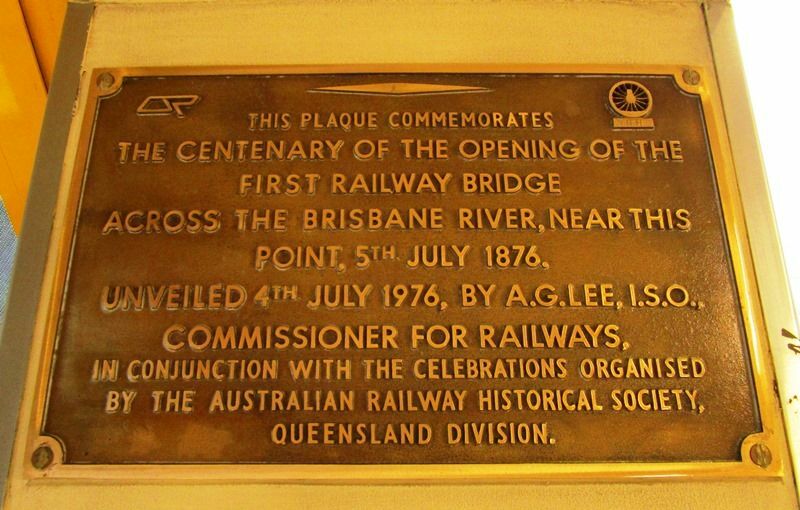 A plaque commemorates the centenary of the first railway bridge which crossed the Brisbane River in 1876. His Excellency the Governor, accompanied by his Private Secretary, and the Hons. G. Thorn, J. R. Dickson, and E. M. Stewart, M.L.A. 's, together with the Traffic Manager and several other gentlemen, left Brisbane by special train on Wednesday afternoon, at half-past two o'clock, for the purpose of formally opening and naming the new railway bridge over the Brisbane River at Oxley. After passing the Indooroopilly station, the train was run over the bridge and back again as far as the 160-feet span, where it had been arranged that the ceremony should take place, and where a portion of the bridge had been decorated for the occasion with festoons of evergreen. (Toowoomba, Qld), 8 July 1876. This plaque commemorates the centenary of the opening of the first railway bridge across the Brisbane River, near this point, 5th July 1876. In conjunction with the celebrations organised by the Australian Railway Historical Society, Queensland Division.